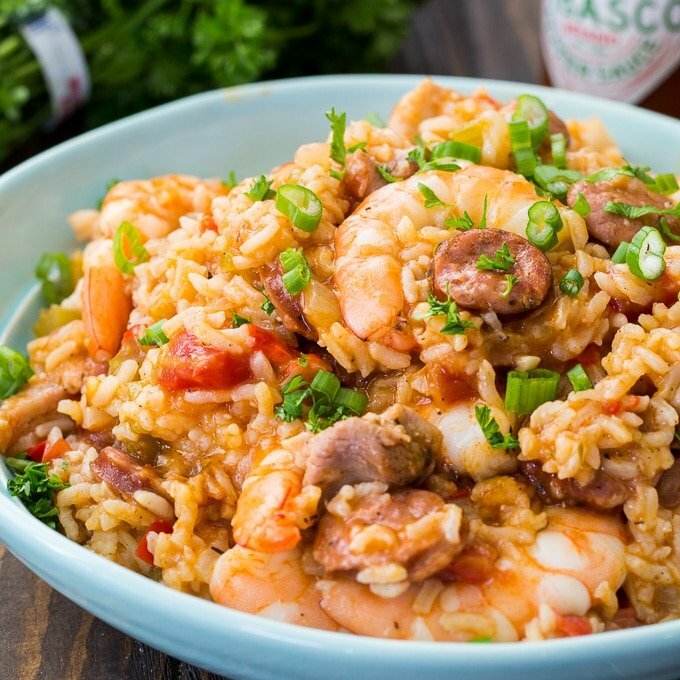 Instant Pot Jambalaya with chicken, andouille sausage, shrimp and lots of spice makes a flavorful New Orleans-style meal. Jambalaya is super easy to cook in a pressure cooker and it doesn’t take much time at all. The Instant Pot does a great job of melding all the flavors together in a short amount of time. First you use the saute mode to brown the sausage and the chicken. If you can’t find andouille sausage, you can use any smoked sausage. I like to use chicken thighs because they are juicier and have more flavor, but you could sub chicken breasts. Then you saute onion, celery, red bell pepper, and garlic. Green pepper could be used instead of red. Next a can of undrained diced tomatoes, rice, Creole seasoning, thyme, bay leaves, Tabasco sauce, and 2 cups of chicken broth get added. The Instant Pot gets set to Pressure Cook for 7 minutes. Do a quick pressure release after the time is up and add the shrimp, parsley, and green onions. Cover the pot and let the residual heat cook the shrimp. 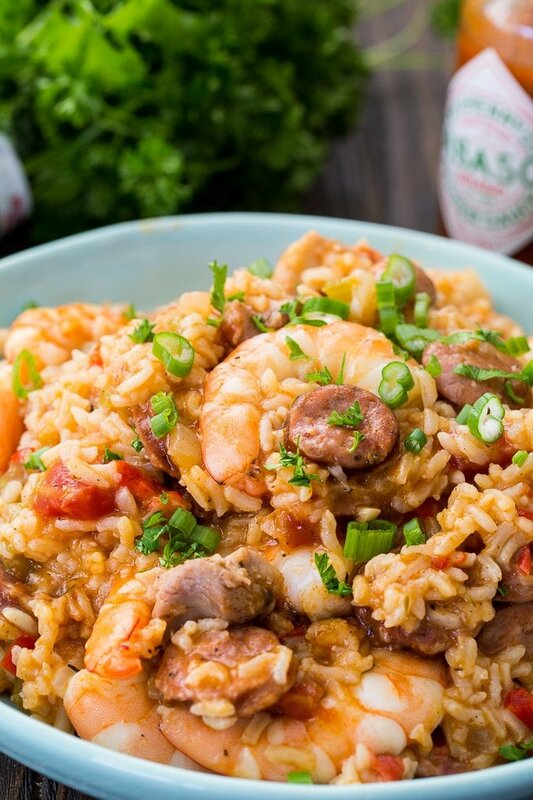 Serve Instant Pot Jambalaya with some crusty French bread for a spicy southern one dish meal. Instant Pot Jambalaya with chicken, andouille sausage, shrimp and lots of spice makes a flavorful New Orleans-style meal. Turn Instant Pot to "Saute" and add oil to inner pot. Add sausage and cook until browned, about 5 minutes. Remove with a slotted spoon and set aside. Add chicken and sprinkle with 1/2 teaspoon Creole seasoning. Cook until browned, about 5 minutes. Remove with a slotted spoon and set aside with sausage. Add onion, celery, and red pepper and cook until onion is soft, about 4 minutes. Add garlic and cook 1 more minute. Stir in 2 teaspoons of Creole seasoning, thyme, salt, tomatoes, rice, Worcestershire sauce, broth, bay leaves, and Tabasco sauce. Stir in sausage and chicken. Turn Instant Pot to Pressure Cook/High (or Manual) for 7 minutes. Be sure valve is in "Sealing" position. Do a quick release and open Instant Pot. Do not open until the pin drops. Stir in shrimp, parsley, and green onions. Cover Instant Pot and turn it off. Let the residual heat cook the shrimp for about 8 to 10 minutes. 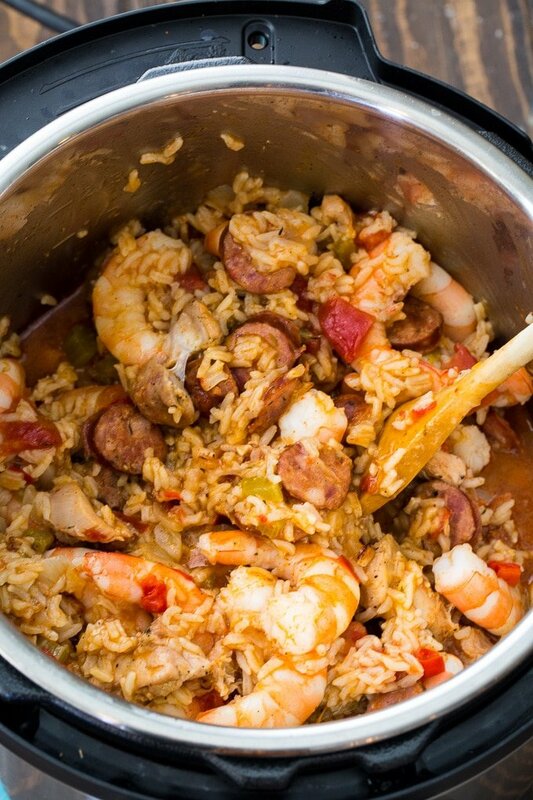 You may like to also try this Slow Cooker Jambalaya. Watch the video below to see how to make it. 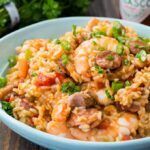 This entry was posted in Instant Pot and tagged jambalaya, rice, seafood, shrimp. Bookmark the permalink. Have you doubled the recipe? I make this recipe every other week. I only use sausage and shrimp. I follow the recipe other than not using the chicken. I have never received a burn code. I also use olive oil to saute my sausage and veges. Ive been making this recipe since I found it over a year ago. Best jambalaya recipe by far. Thank you for sharing. Every time I make this people go crazy over it! I follow the recipe exactly as printed and it’s perfect! This is my go to Mardis Gras recipe! Thank you for sharing. I hardly ever leave reviews, but I have to say: this recipe is perfect! So easy to follow, and it is extremely delicious! I skipped the Tabasco sauce, and used red pepper instead of green pepper, and added half a chopped carrot. I bought frozen pre-cooked unshelled shrimp and made sure it was defrosted for the recipe. Turned out perfect! Thank you so much! I will be adding this to my weekly repertoire! I keep getting a burn message. I have added water twice, scraped the bottom etc. You may want to test your recipe and adjust accordingly, as I am winding up having to cook this conventionally defeating the purpose. I am very sorry you got the burn message. I think Instant Pots are just really temperamental. I’ve cooked a recipe fine at least a half dozen times and then gotten a burn message. I also get a burn problem. I have an older instant pot– with no burn alert; but the bottom burns ,so the pot never comes to pressure. I read somewhere that tomatoes (because of their sugar content) are often the culprit — and recommended just layering the tomatoes on top. But thatdidn’t help. I think the rice is the problem— one version of the recipe suggests coating the rice in the oil before pressurizing. i think that is a problem— since it is clearly th rice that sticks to bottom and “burns”— brown, but still tasty. Im going to try not cooking the rice at all before pressurizing. Elsewhere I’ve read that heating up the pot and ingredients— with the liquid also helps — since nothing gets time to burn on the bottom before pressurizing. I will try that as well. I did too. Way too little linguistic. Finished it on stovetop. Very disappointed. Used my IP many times with no problem. Second time trying this reciepe and gotten a burn message both times 🙁 I just finish cooking it on the stove top. I made this recipe and it was my 1st try with the Instant Pot. The rice was not cooked after 7 minutes. Was I supposed to cook the rice first. Was hoping to see a response since I had the same problem. I used brown, long grain uncooked rice. Absolutely love the recipe…hoping for this one fix. I just made this for the first time and I had the same problem with the rice. Is the shrimp precooked ? It does say deveined and peeled, but not precooked. I’m not fond of tomatoes and I like a Cajun “brown” jambalaya. I let the sausage and chicken cook til the bottom of the pot is covered with a sticky “fond” (brown scalded bits) but not burned, and then I throw the mirepoix. All the water in the celery onion and peppers is enough to deglaze the fond, but if not, continue deglazing with the chicken stock until the bottom of the pot is clean. Then continue with the recipe without the tomatoes. Add an extra quarter cup of stock to replace the water from the tomatoes. The fond adds a nice flavor and a brown cast to the jambalaya. Wondermous! Excellent recipe. My family (we’re from New Orleans) thought this was a good as any we had eaten in a long time. Thanks Christin. This was delicious but I realize I didn’t add the rest of the Creole. When do we add in the additional 1/2 tsp of Creole seasoning? Thanks for pointing that out. I fixed the recipe. It gets sprinkled on the chicken, but it’s not really going to change the flavor much if it is omitted. Can you double this recipe in a 6 quart? Loved how this jambalaya turned out I am now even more in love with my Instant Pot! Love this recipe. I make this 2-3 times a month. So quick and easy. I use shrimp and sausage only. Love how it taste like its been cooking all day. So happy you enjoy this jambalaya Rhonda! I read it multiple times and kept overlooking it too. I guess since it’s listed in the middle of the seasonings. This turned out great! I ended up naturally releasing it … I used brown rice and was worried the 7 minutes wouldn’t be enough. I didn’t have shrimp or scallions (and you are right definitely needs something green. I may sauté some zucchini just to break up the color. Thanks!!! Have you ever substituted white rice for brown? I want to make it with brown rice but being new to instant pot cooking, I’m afraid of undercooking everything. Can I do the brown rice in a separate pot until close to being done and then add it in so it won’t overcook? Is this recipe for a 6qt machine? I have an ultra 8qt & I’m cooking for a large group next weekend!! Could you estimate how much to increase the recipe for a full 8qt size? Many thanks for any info you can provide!!! Yes, it is for a 6-quart Instant Pot. If you have a larger one, I would increase each ingredient by 25%. Can I use basmati rice? No where in the description or recipe directions is the rice ever mentioned. It’s not in step 5. Step 5- Stir in 2 teaspoons of Creole seasoning, thyme, salt, tomatoes, rice, Worcestershire sauce, broth, bay leaves, and Tabasco sauce. Stir in sausage and chicken. I read it multiple times and I kept overlooking it too. Guess since it’s in the middle of all the seasonings.